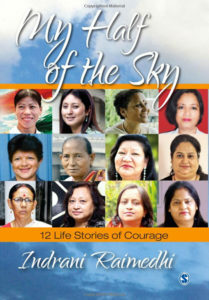 The 12 women who feature in this book by Indrani Raimedhi come from diverse backgrounds. The thread that binds their stories is their resolve to change the circumstances of their lives, overcoming tremendous odds, and giving wings to their dreams. They’re survivors and pathfinders, doers and dreamers, leaving in their wake surging inspiration and hope. Their testimonies, including one by Hasina Kharbhih, reveal what it is to live in this often forgotten corner of India, and to overcome personal tragedy, the filters of tradition, discrimination, and coped bravely with harrowing violence and uncertainty. To know more about this book and to buy it online, please click here.